She was the daughter of the Spanish author Teodoro Bonaplata. In 1886 she made her debut at the Teatro Dal Verme in Milano in G. Verdi’s ‘’Aida’’. During her career this part remained her special star role . In 1891 she appeared at the Teatro Argentina in Roma again as Aida. In 1890 she married the conductor Lorenzo Bau. 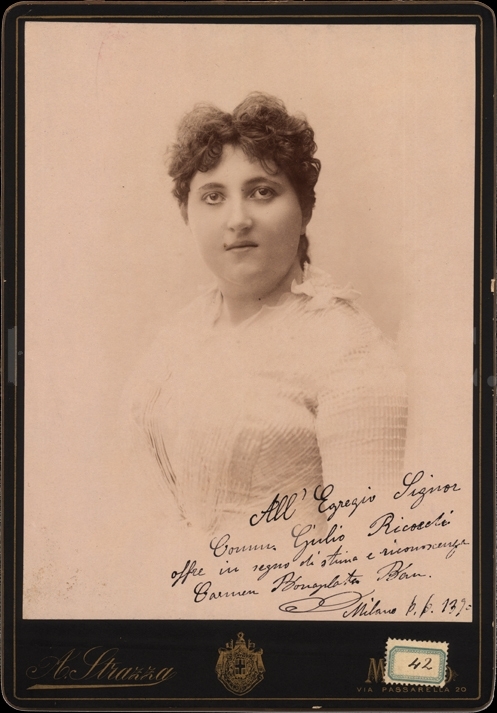 In the 1892-1893 season she sang at the Teatro alla Scala in Milano. Here she made her debut as Isabella in ‘’Cristoforo Colombo’’ and participated also in performances of R. Wagner’s ‘’Fliegenden Holländer’’ and in ‘’Il figliuol prodigo’’ by A. Ponchielli. In 1894 at the same opera house she sang the part of Sieglinde in R. Wagner’s ‘’Walküre’’ and in the title role in A. Catalani’s ‘’Loreley’’, in 1897 as Elisabetta in ’’Don Carlo’’. In 1894 she was active at the Teatro Carlo Felice in Genova, in 1896 in Buenos Aires. In the 1896-97 season she was to be heard at the Teatro San Carlo in Napoli. She undertook a tour through the USA and appeared as a guest at the Opéra de Monte-Carlo (1901) and at the Court Operas of St. Petersburg and Moscow (1897). In 1900 she was active at the Teatro Regio in Parma, where she sang the part of Aida opposite the Spanish tenor Carlo Barrera. As Gioconda she appeared with great success at the Teatro Regio in Torino (1892) and at the Teatro Politeama in Palermo (1893). She retired from the stage in 1904. Her daughter Carmen (Carmelita) Bau de Bonaplata, like her mother, became a respected soprano and appeared with success at italian and Spanish operatic stages.